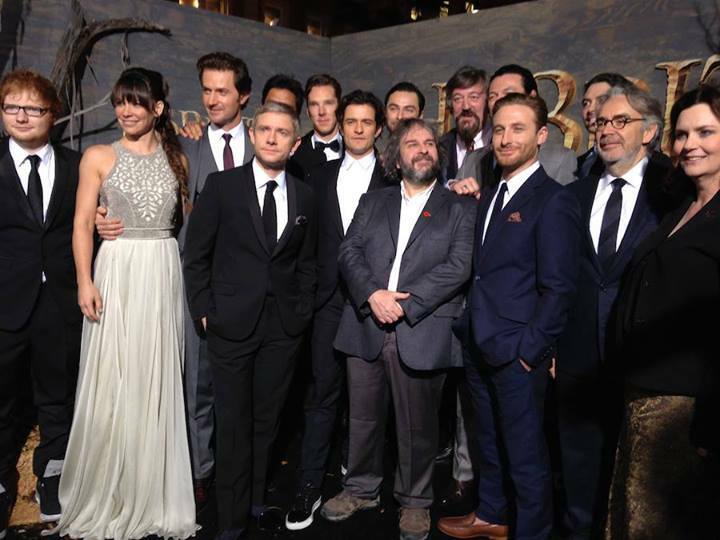 The Hobbit: The Desolation of Smaug - Peter Jackson and the Cast. From left to right: Ed Sheeran, Evangeline Lilly, Richard Armitage, Martin Freeman, Benedict Cumberbatch, Orlando Bloom, Peter Jackson, Stephen Fry, Luke Evans, Dean O'Gorman, Aidan Turner, Howard Shore, and Philippa Boyens. HD Wallpaper and background images in the द हॉबिट club tagged: photo the hobbit the desolation of smaug 2013 live world premiere cast peter jackson. This द हॉबिट photo contains बिजनेस सूट. There might also be सूट, कपड़े का सूट, ड्रेस सूट, पूरी पोशाक, tailcoat, पूंछ कोट, पूंछ, सफेद टाई, सफेद टाई और पूंछ, पोशाक सूट, पूर्ण पोशाक, टेलकोट, पूँछ कोट, पट, दो टुकड़ा, दो पीस सूट, लाउंज सूट, दो टुकड़े, and दो टुकड़ा सूट.